I'm putting together a LifePo4 battery pack with the intention of replacing the 12V lead acid battery in my 4WD. So far, what I've got is the following. 4 x 10 Ah LifePo4 batteries (38120 Headway) in series to get my 12v (12.8 is close enough I think). 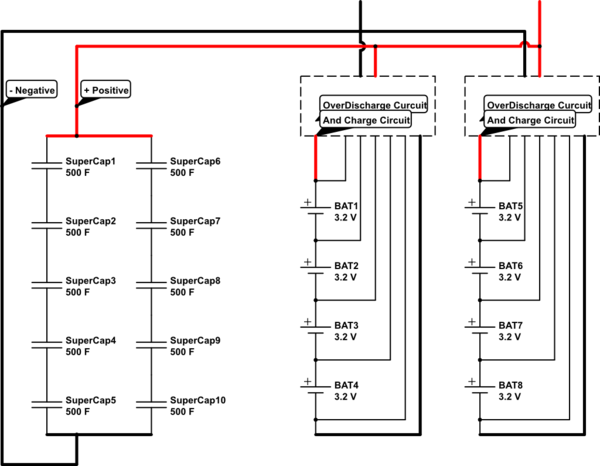 Plus 5 x 500 Farad supercaps (2.7V * 5 = 13.5V) to supply the initial starter load. My battery pack contains 2 lots of the above to supply extra power and hopefully longevity. What I need is some over discharge protection (and maybe overcharge? but I dont think that should be a problem) I'm not an electronics engineer so cant design something myself, but I was looking at something like this on ebay. https://www.ebay.com.au/itm/3S-4S-100A-12V-w-Balance-LiFePo4-18650-Battery-BMS-Protection-Plate-Board/282814976228?ssPageName=STRK%3AMEBIDX%3AIT&var=582140823314&_trksid=p2060353.m2749.l2649 but with LifePo4 Charging specs (3.2V). I did see this... https://www.ebay.com.au/itm/3S-4S-100A-12V-w-Balance-LiFePo4-18650-Battery-BMS-Protection-Plate-Board/282814976228?ssPageName=STRK%3AMEBIDX%3AIT&var=582140823316&_trksid=p2060353.m2749.l2649 This seems to fit the bill better, but I'm unable to work out what to do with all the multiple input/output lines. Can the + charge/discharge be simply joined and the same thing with the - lines? Is there something better I can use? simulate this circuit – Schematic created using CircuitLab Decided to include a very basic schematic. What I'm really asking is; Can anyone help me with the circuit I have just drawn as a dashed box? I realise I may need to put a relay triggered by ignition to separate the caps from the batteries so that the caps are not constantly feeding into the charging circuit and depleting when the car is not running. I think I may also need to put a switch on the battery to disable the charging circuit completely so that if the vehicle is left for any length of time the unit can be shut down and the charge circuitry is not still energised slowly draining the cells all the time. My primary target vehicle is a 4WD RV used for only 1/2 the year. I'm tired of every year replacing at least 1 of the 2 large lead acid batteries due to lack of use. From what I understand, if I get this right, my new battery should last 10 years or more. and not suffer from lack of use. Browse other questions tagged automotive 12v lead-acid lifepo4 replacement or ask your own question.